Almost everyone dies owing at least some debt. Sometimes it’s only last month’s ordinary bills plus final medical expenses. But there can be shocking surprises for survivors – debts unknown to the children and even to the spouse of the deceased. Heirs might discover large credit card balances, undisclosed home equity loans or gambling debts. Creditors are entitled to payment, from the money and property (the “estate”) that your loved one left behind. But what if he or she didn’t leave enough to get everyone repaid? Can the creditors come after you? Sometimes yes, sometimes no. With loans secured by property, such as mortgages, an heir has to keep up the monthly payments or else sell the property to cover the debt. Unsecured loans, such as credit card debt and student loans, are another matter. Your liability depends very much on the nature of the bill, the type of property and your state’s laws. But here’s what I can say, generally. Some money is protected. At death, unsecured creditors cannot collect from life insurance payments, pay-on-death bank or brokerage accounts, jointly held property that passes directly to the surviving owner, or retirement plans such as 401(k)s and IRAs that have named beneficiaries, says IRA expert Ed Slott of IRAhelp.com. They’re safe – but only if they were handled right. By “right,” I mean that the deceased filled out a beneficiary form for each account, naming the people who were to inherit. If this step was skipped, the funds will be paid into the estate, where they can be used to satisfy the creditors. Your signature matters. If you signed a joint application for a credit card, you owe the balance even if you didn’t know how high it had grown. If you were merely an “authorized user,” however, most states don’t require you to pay. (Note that authorized users shouldn’t use the card after the owner dies if the estate is broke. Such spending could be considered fraud.) Spouses are generally not liable for any separate debts their mate incurred before the wedding or, in most cases, after. Rules in community property states, such as Texas and California, are different. Your community property can generally be tapped to pay a spouse’s debts. But creditors can’t take your separate property, says Cathy Moran, an attorney in Mountain View, Calif. In any state, you’ll still owe any private debt you cosigned with the deceased, such as a student loan. Some private student lenders will forgive the loan, but most won’t. You have to pay the doctor. Final medical bills are usually considered a spouse’s responsibility. If your mate entered a hospital, the admission papers you signed probably included a payment agreement. When there’s no money, however, and the survivor has very little income, health providers might write off the account. Get tough. Don’t be talked into making a few payments on bills you do not owe. 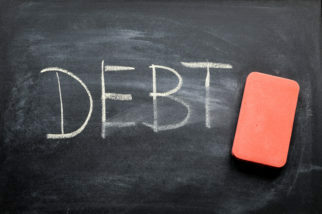 Creditors might claim that you willingly assumed the debt. Tell them, “No, no, never.” You know your rights. Source: AARP. Jane Bryant Quinn. 9/2018.